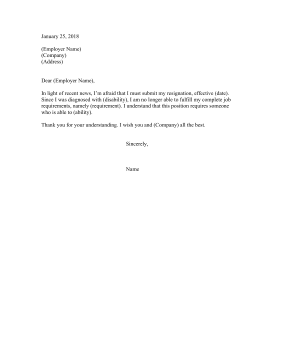 Short and to the point, this resignation letter cites a new disability as the reason for leaving. In light of recent news, I'm afraid that I must submit my resignation, effective (date). Since I was diagnosed with (disability), I am no longer able to fulfill my complete job requirements, namely (requirement). I understand that this position requires someone who is able to (ability). Thank you for your understanding. I wish you and (Company) all the best.